I love when clients incorporate their shore homes in to their engagement photos! 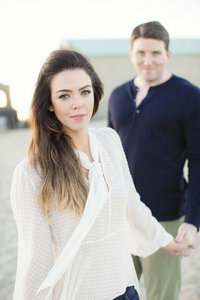 This Jersey Shore engagement session is definitely one of my favorites! Check out some more images below and read about Joy and David’s love story! Dave and I met online on a dating app called Coffee Meets Bagel. Then, we skyped and realized that we had both graduated from Muhlenberg College, although we were never at the school at the same time since Dave graduated in 2007 and I was there from 2008-2012. It just so happened that our college alumni group was having an annual meetup a few towns away from where I lived, so we decided to meet there for the first time. We went on our first date a few days later that consisted of going to Monster Golf, a bookstore, and Park West Tavern in Ridgewood. From that point on, we realized how much we enjoyed talking to each other and how much fun we had together and became inseparable. Buying our first home and doing some more traveling. On November 25, 2017, Dave took me for a morning walk on the boardwalk in Spring Lake, NJ, where my parents have a beach house. I saw my name written in the sand and thought he was going to propose to me right there, but he just wanted to take a quick picture and go. I was initially disappointed when he didn’t propose in that moment, so I was extra surprised when he proposed to me 45 minutes later on our walk by the water. I like to think the writing of my name in the sand, which was not done by him and had nothing to do with the proposal, was a sign from God saying our relationship was meant to be. One of my favorite memories of us is when we saw Finding Neverland in NYC for my birthday when we first started dating in 2016. One of Dave’s favorite memories of us is when he took me to Dallas for the first time to meet his extended family.